Bow hunter Mike Scully assured attendees of a town meeting in Manoa last night that archers take every precaution toward safety while hunting for pigs. They might be smelly and often nasty, but the wild pigs of Manoa found plenty of supporters last night among more than 120 people who attended a meeting to discuss their future. Hunters, animal rights activists and residents with pig problems asked questions and shared their concerns at Manoa Elementary School with the Department of Land and Natural Resources. 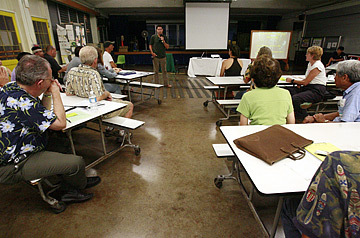 The DLNR laid out plans to use hunters without guns and box traps to cut the feral pig population in Manoa and Tantalus. Rep. Kirk Caldwell said that in addition to property damage and being a danger to humans, "pigs were contributing to the flooding in Manoa." Pigs have been blamed for damaging trails and forests and threatening the watershed. Others were concerned about residents taking them in as pets. "They're cute when they're little but they get big pretty quickly," said Manoa resident Shalane Sambor, who blamed the pigs for damage to the watershed. DLNR officials said the pilot project is planned for a year to hunt pigs during the fruiting season, when the animals stay near the food source, and the rainy season, when they approach homes. DLNR will work with the Pig Hunters Association of Oahu and other hunters. It has proposed a Wednesday and Sunday schedule. A full-moon hunt is also being proposed. Hikers would not be allowed on those days, and signs would be posted at trail heads. Animal rights activist Cathy Goeggel opposed hunting and traps, particularly bow hunting, since the animal would survive an arrow and suffer longer. She proposed contraception as a humane method of controlling the pig population. A fifth-grade teacher also said he did not support killing the pigs, "sweet, intelligent animals." "Do we want to send a message to kids that it's OK to kill?" Hunter Corey Vidinha said he hunts with a knife since the animal dies faster. "I don't let them suffer all that long. I was raised eating wild pigs," he said. "We hunt to actually feed ourselves."